New part of Malpas opens doors! 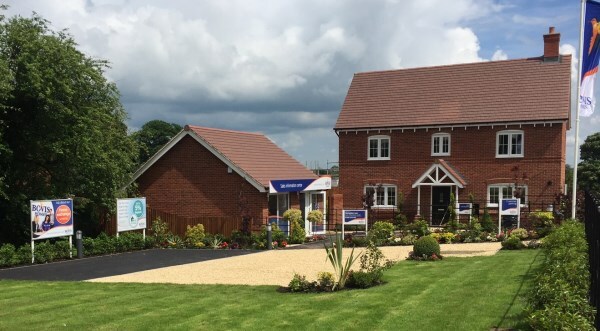 A brand new show home is opening in the village of Malpas this weekend and Cheshire house hunters are being invited to go along and join in the party! They'll find out just how much more they could get for their money when they visit the four bedroom Montpellier at Hampton Lea, an attractive new location by Bovis Homes. The opening takes place on Saturday 25th June and buyers can visit between 10:00am and 5:00pm to see this stunning new property. With a number of exciting features to attract buyers, the new development of three, four and five bedroom homes is already attracting plenty of interest in the local housing market. The Montpellier includes an open plan kitchen and dining area with integrated appliances, sitting room with French doors to the rear garden plus en suite and built-in wardrobes to bedroom one. Regional Marketing Manager Carina Wilde said: "If you are looking to move, it is well worth paying a visit to Hampton Lea this Saturday. Bovis Homes create contemporary communities built to traditional standards, and include so much more than many other house builders. What others consider as extras, we include in the price, such as the integrated kitchen appliances, which means you are getting so much more for your money and your home is ready to move into." To help buyers secure their new home at Hampton Lea, Bovis Homes offers a variety of purchase assistance schemes. For instance, Help to Buy is a 75% Government-backed shared equity scheme for new build properties only requiring a 5% deposit, while with Home Exchange Bovis Homes could buy your old house to get you moving. The homes come with a 10-year NHBC warranty and there is also a two-year guarantee from Bovis Homes, managed by regional Customer Care teams who are also available to provide you with advice and direct assistance. For more information about Hampton Lea and all Bovis Homes purchase assistance schemes, call the sales team on 01948 504004 visit www.bovishomes.co.uk.